The original Warhammer was designed as an assault BattleMech. However, it had been superseded by later and heavier 'Mech designs, though it remained a powerful weapons platform. The Clans wisely maintained and built on this solid frame a real assault 'Mech, the Warhammer IIC. Thanks to their technological expertise, they were able to add ten tons with the same speed and firepower and nearly double the armor of the original. The Warhammer IIC is built on an Endo Steel frame and is protected by twelve tons of Ferro-Fibrous armor. The result is a dangerous 'Mech, able to hold its own in any battle against the Inner Sphere. Also note that the armor was the primary concern when designing the IIc version rivaling even 100 ton assault 'Mechs in durability and protection . Paired Mk. 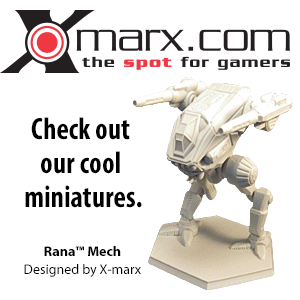 XVII ER PPCs allow the Warhammer IIC to inflict fifty percent more damage than the regular Successor States' PPCs. Added to an SRM-6 launcher and five Medium Pulse Lasers, this firepower overwhelms most 'Mechs of equal or lesser tonnage. Twenty double heat sinks keep the design relatively cool. NOTE: As of this writing there is no Canon Record Sheet for this variant. Another Dark Age era variant boasting the incredible load of four General Systems Heavy Large Lasers and two Pattern J7 SRM-6 launchers. The first Hero 'Mech variant of the Warhammer IIC, the Maul carriers an ER PPC in each arm. Each torso carries a SRM-6, Heavy Machine Gun, and a Medium Pulse Laser. The 'Mech carries two tons of machine gun ammo and three tons of missile ammunition. An Anti Missile System is mounted in the center torso. This variant mounts eight Double Heat Sinks and carries a 320 Standard Engine. The second Hero Variant of the Warhammer IIC, the Bludgeon carriers an ER PPC in each arm, an ER Medium Laser in each side torso supported by right torso ATM 6 fed by a three ton ammo bay, along with three Jump Jets mounted in the Torsos. The A variant carries a LB 10-X Autocannon in each arm, supported by a Streak SRM-6 and ER Medium Laser in each side torso, with an additional ER Medium in the center torso. 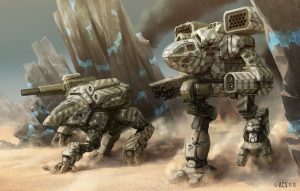 Carrying two tons each of autocannon and Streak reloads, the Warhammer IIC is built around a 320 Standard Engine, Endo Streel frame and Ferro-Fibrous armor and carries twelve double heat sinks. Warhammer - Ten tons lighter, the Warhammer was one of the mechs the Star League Defense Force would take with them to the Exodus Fleet. The original design was meant to be an Assault Mech, but its purpose would be fulfilled when the SLDF-in-exile became the Clans. The technology of the clans would convert its weapons to clan standards and increase the design up to ten tons. Thaddeus Marik - Dark Age former Republic of the Sphere Paladin piloted a Warhammer IIC 4 variant named Kriegaxt..
Galaxy Commander Beckett Malthus of Clan Jade Falcon piloted a Warhammer IIC during his battles during the invasion of the Republic of the Sphere.